Beijing is after foreign spies in its streets and hallways, and, just like last year, April 15th in China will be National Security Day. 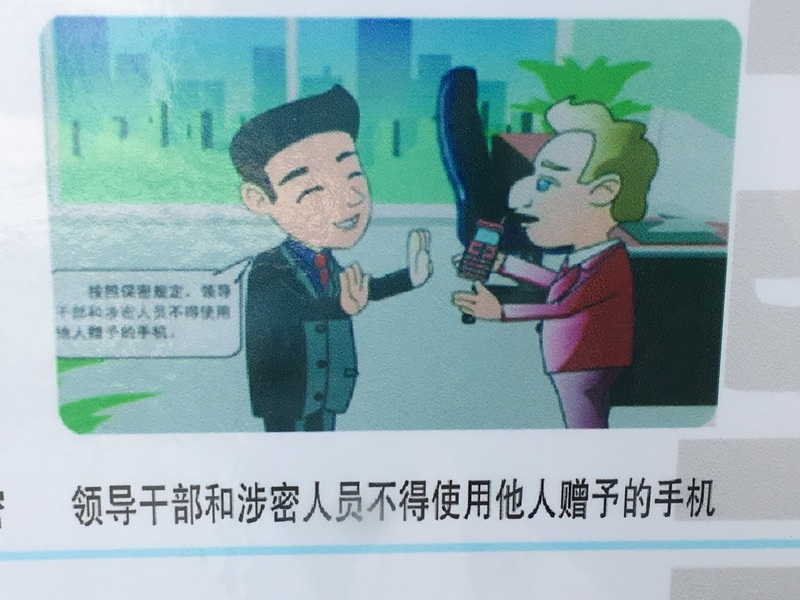 For now, the story that’s attracting a great deal of attention abroad is the announcement that China’s capital city is seeking to encourage its residents to look more carefully for espionage by offering substantial cash awards—up to 50,000 RMB for leads that end up thwarting foreign spies, and up to 10 times that amount for actions that “make an especially major or special contribution” [贡献特别突出的线索] to stopping intelligence operations against China. Lost amidst all the outrage and accusations of paranoia by some over this announcement is why Beijing is doing that and what it says about policy challenges for some here in China. In fact, the article in Beijing Daily that carried the news of the reward system presents a lengthy explanation of the reasons behind this move to get residents involved. The logic that's presented actually makes a lot of sense, which isn't surprising since their ranks tend to be composed of some of the best and brightest officials. Beijing, the piece contends, is “the national political center, cultural center, science and technology innovation center, and center for communication with the outside world—the first choice of foreign intelligence agencies for subversion, suborning, and theft.” Security officials there argue that “it is because of the special status and characteristics of Beijing that the task of safeguarding national security and the social and political stability of the capital is more arduous”, and assistance from the public is needed. With so many potential targets for intelligence-gathering (as well as a large if dwindling foreign presence in China’s capitol), offering cash incentives to Beijing’s residents is thought to be an encouragement for them to stay alert against anyone looking to steal secrets, especially foreigners. That the State Security people have had to justify this move is itself interesting, if only because it’s rare for them to do so publicly. More on that below. It’s also important to note that it’s only Beijing and its particular State Security branch that’s thus far offering these economic incentives to spy-stoppers—not the Chinese government as a whole nor the entire State Security apparatus, nor other departments, bureaus and agencies, all of which have officers looking out for leaks and espionage. There's a National Security Day, but the reward system isn't national. The new reward system is likely being put into operation because Beijing’s residents are usually either too busy working or commuting to spend time watching for foreign agents. The huge number of migrants who toil in China’s capitol aren’t interested in their surroundings so much as making a living for themselves and family members back home. Like so many policy announcements here, the effort isn’t to alarm citizens but to rouse them from their apolitical slumber. And the way to do that in Beijing at least, in the eyes of authorities there, is to offer the possibility of money. But that's Beijing: It's the Sun in the Chinese political universe, with the provinces treated as mere planets in various orbits. Still, it’s also only one place. Other officials are preparing for National Security Day differently. 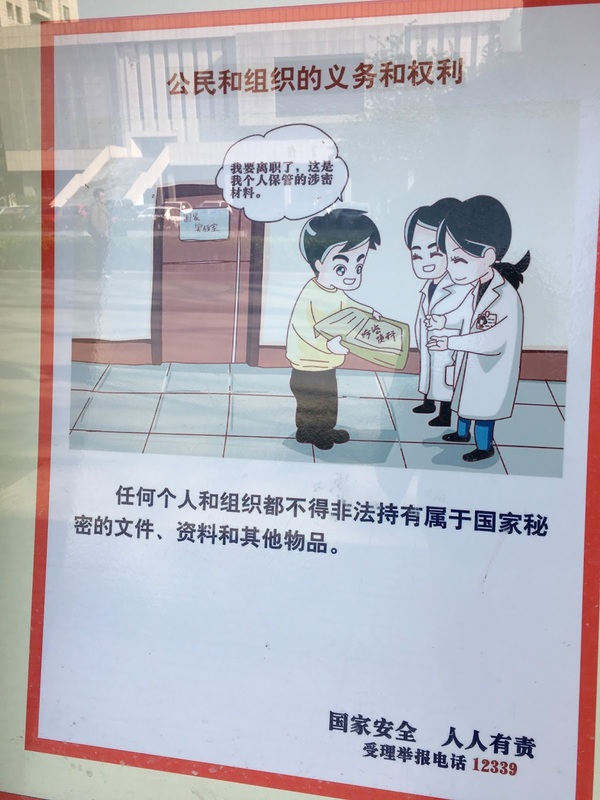 For example, a university in Jiangsu has been employing posters to alert staff and students to help safeguard China’s secrets from outsiders, using examples of what they need to keep a look out for. 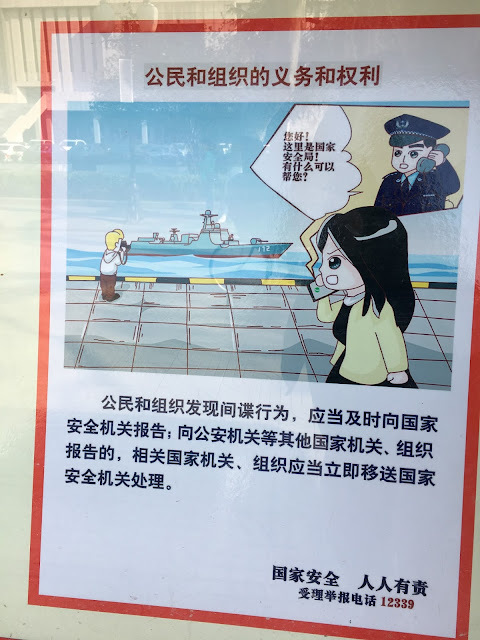 In one sense, this poster campaign is another attempt by Chinese officials to mobilize the masses [“一切为了群众，一切依靠群众”]--to get them interested in the affairs of State. 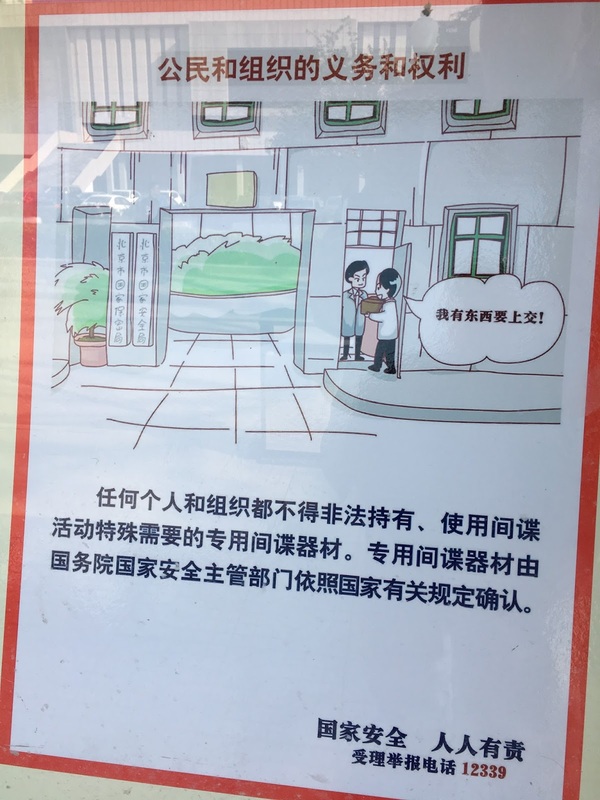 People—in this instance, students and others on university campuses—are needed to watch out for foreigners who some authorities are convinced wish to do China harm. But this campaign is also a case-study of what seems to be bothering at least some people in Chinese leadership circles. China’s National Security Day reflects the view of many here that there are real enemies abroad and at home. At the same time, the campaign hints that at least some in Beijing think that the security services aren’t doing as good of a job as they should be in protecting the country’s secrets. After all, there was never a need for a special day or for special payouts until rather recently. As Beijing Daily duly notes, even China’s State Security admits that it needs citizens to assist them in stopping foreign intelligence agents from “exploiting existing loopholes” [无隙可乘] and acquire information. This strategy doesn't demonstrate that the security mob is dominating Chinese decisions, but that it's having trouble implementing them. Is the threat from foreign spies growing then? Perhaps it really is. Are Chinese security officials concerned about their own capability to counter that threat? It appears very much so. Securing the borders, guarding cyberspace, shielding the nation's secrets--these are all tough tasks in the post-modern world for any government, even as one as focused as China's. 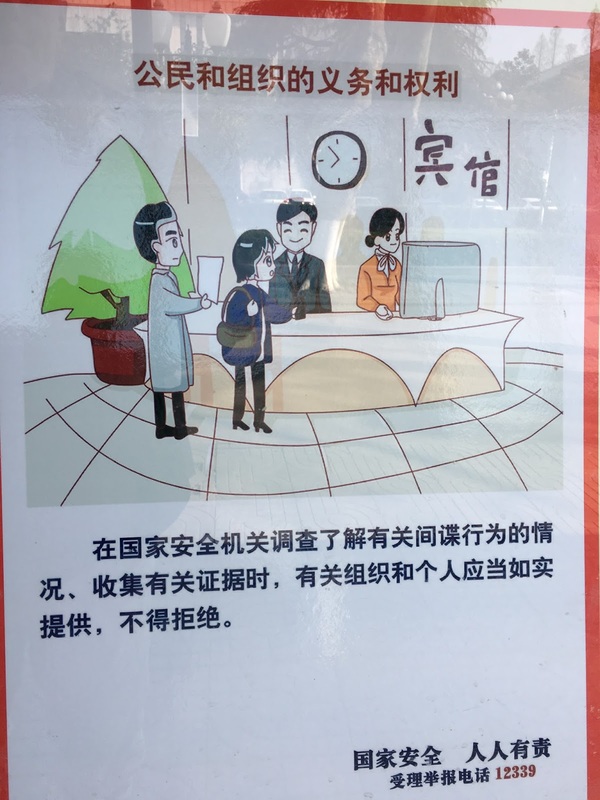 But that Beijing itself thinks it needs to pay residents to be alert patriots--and that both national and local authorities continues to employ posters to get others to simply pay attention—probably aren’t good signs for anyone—for foreigners, or for the officials in charge of security work here. You have to wonder who the real enemy here may turn out to be.